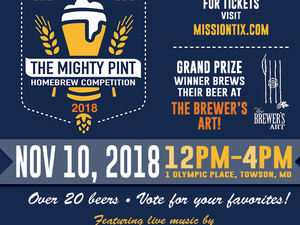 WTMD's 4th Annual The Mighty Pint Homebrew Competition, Presented by Bond Distributing and Nepenthe Brewing Co. Join us on Saturday, November 10th from Noon to 4pm for WTMD’s 4th Annual Homebrew Competition! Enjoy unlimited tastings from over 20 area home-brewers, a commemorative glass and live music. PLUS, your votes will help determine the popular vote winners, and the Judges Panel will determine the GRAND PRIZE winner whose beer will be brewed at The Brweers Art. This is a rain or shine event. Tickets are limited.